If you are a mother or want to be someday, I want you to think for a minute about your life. Would you want your child to live their life the way you are living yours? I hope the answer is yes because you are living a life that you love so much. But, if not you are not alone. The majority of parents want their children to have a better life than they do. I was thinking about this the other day. My oldest daughter shared a dream of hers with me the other day. It’s something she would like to do when she is an adult, but after sharing what it is she said something along the lines of, “well, that’s not going to happen because life doesn’t go like that.” That hit me hard. I know it’s cliché to say “you can be anything you want to be”, but I really do believe (that within some realistic limits set by genetics and things like that). But, that aside I want my children to believe they can be whatever they want to be when they grow up because I am finally figuring out how to do that myself. So many of us adults are not following our dreams that we are not showing our children how to follow theirs. We may be telling them they can be whatever they want to be, but then we live too afraid to even go after our own dreams. We set the example for our kids that they should compromise on their dreams and I’m not doing it anymore. The list goes on and on, but the funny thing is… most of these things are things that you can change. No, you can’t change your age, but we put way too much emphasis on age anyway. There are TONS of stories of children making a huge impact in their community and elderly people going back to college to go after their dreams. The only thing that is really holding you back is yourself. There is a website called Rafael the Unicorn that is full of beautifully written short fairytales to encourage and inspire children. One of those stories is called The Factory of Dreams and it is a story that I think we can learn from as well as our children. If you have just a minute pop over to the link and read the story. Then, get to work figuring out what steps you need to take to free your dream and go after it. It’s ok if you don’t know exactly what to do, just get started. 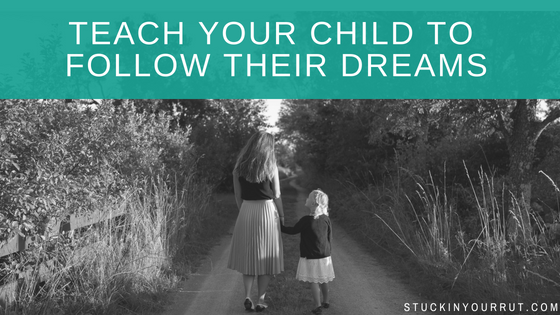 Pave the way so your child can believe that their dreams are possible too.